You can load Customization files from LOADCUSTOMIZATION command (in AutoCAD Menuload). When you run this command then ‘Add/Remove Customizations’ dialog box will pop up. Here, some default Customization files will be shown from DraftSight (DraftSight professional). You can select any and remove but it is not recommended to remove default customization files. Click on ‘Browse…’ tab to add new Customization file if you have. Select customization file if its in same path or search for location and select and open file . Here, For demo purpose Go to CadOasis.com in DraftSight this post and download ‘CadOasis DraftSight Menu V1.0’ customization file and open. 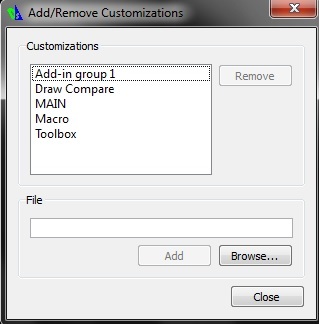 On ‘Add/Remove Customizations’ dialog box this will be shown in File section now Click on ‘Add’ tab and you will see it in ‘Customizations’ list. Click ‘Close’ on dialog box. You will see a new Menu next to Help menu!